Not very foccacia-ey this one, because I made the mistake of not letting my dough rise for the second time. I wanted to make pizza but pizza was for dinnertime and I was stuck in that limbo-time between lunch and dinner. After I made the dough for the pizza and had let it rise for an hour, I still had a couple of hours till dinner. I wanted a snack while I waited for dinner. So, I made another batch of dough. I used Mario Batali's dough recipe from his new book, Italian Grill . I made my dough whole wheat: Instead of the 3 1/4 cups of all-purpose flour, I did 1-1/2 cups of whole wheat flour and 1-1/2 cups of all-purpose. I was very surprised to find some white wine in our fridge. It has probably been there for a long time and was now turning into vinegar. Oh well, I figure the most damage it would do would be to add some sourness to the dough. Anyway, I mixed all the dry ingredients and incorporated all of the wet until they came together. I kneaded the dough until it became smooth and sprang back when poked. In an oiled bowl, I covered the dough and waited for it to rise. After it had risen to twice its size, I punched it down. The dough at this stage is ready to be made into pizza or foccaccia. 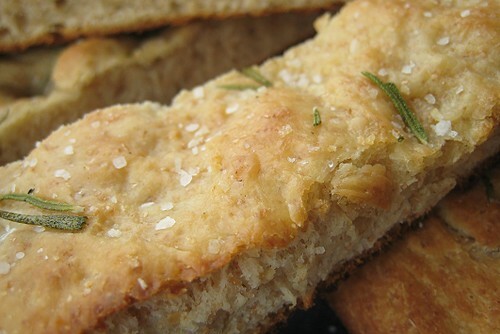 To make my "foccacia," I added two tablespoons more of olive oil and stretched some dough into a square pan, added some rosemary, and sprinkled the dough with salt. I baked it for about 20 minutes at 450 degrees. I should have let it rise for another 30 minutes in the pan, but I forgot. After its time in the oven, it was perfectly "eatable". I like it, of course, with some balsamic vinegar and extra virgin olive oil. It's a little bit softer than traditional foccaccia but it's good enough for me. 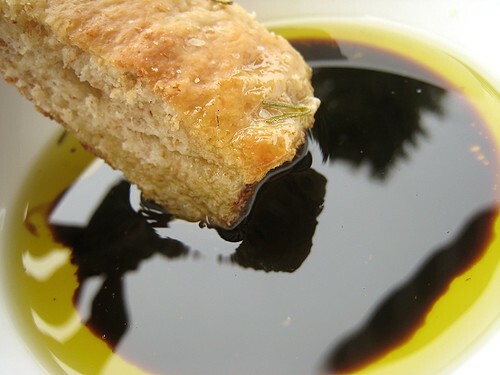 I love dipping freshly baked warm foccacia in balsamic+ extra virgin olive oil, just like what you did! Yup - I'm in love. vinegar and oil too - yes! I'm so putting this on my list of things to try! I could eat foccacia everyday. 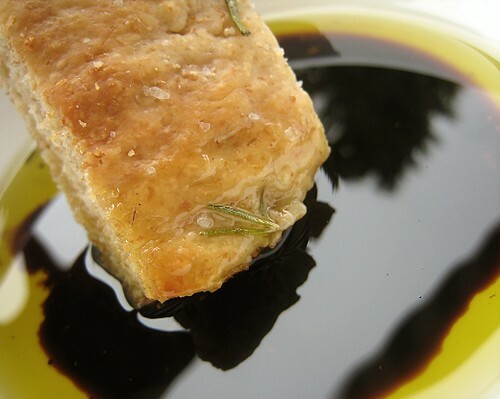 I love the simplicity of your version served with balsamic and olive oil. Splendid! Perfect or not, it looks good to me! I love foccacia and have meant to try making it for...way too long now. wow now you are baking! pro!! I am not sure how, but I feel like I can smell the delicious aroma of foccacia baking in the oven. It just looks super yummy! This really looks so good. I can almost taste that salty chewiness! I'm starting to get into bread (just made great black bred the other day) and want to try my hand at foccacia. Thanks for the idea! It's JS' domain. I always say, "What are we going to do with all that bread?" Hehe. JS has recently started breadbaking... we got the books _Artisan Bread in Five Minutes a Day_. Now I have to go open a bottle of wine just to make bread dough with it. It looks delicious! Still looks good to me... I know exactly what you mean by that time between lunch and dinner. Never had focaccia for merienda, though! JS has made several more foccacias after this, and she just leaves it on the table. Everytime someone would pass by, a little piece would go missing. OMG - you're killing me! Those pictures!! Stunning. Thanks! =D Natural light is my friend.